Almost every CE that comes out checks most, if not all, of those boxes, and rarely is there anything else on offer. Lara Croft: Temple of Osiris Gold Edition is no exception, with numbers 1 and 7 the only things from that list that aren’t present. This by-the-numbers approach isn’t necessarily a bad thing, and Gold Edition is proof of that. There’s nothing in this package that’s out of left field, but the mini Lara figure alone makes it worthwhile, especially if you can get it on sale – which isn’t hard at all, since it seems like every games store has stacks of them they’re trying to unload. I got mine for $20 – it normally retails for $70. 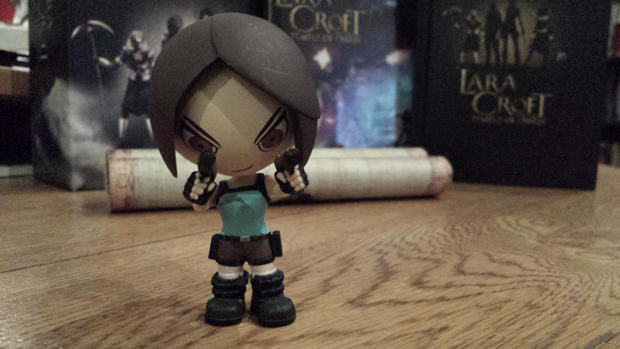 The mini Lara statue is, without a doubt, the highlight of this collector’s edition. With its big head, tiny body chibi style, it’s ridiculously cute. But don’t let that fool you – the statue is as tough and sturdy as Lara Croft herself. Despite how top-heavy it is due to the large head, it stands up easily and doesn’t show any risk of falling over for anything less than an earthquake. On a closer inspection, the statue shows a few more flaws, mainly with the painting. In some less-visible places, like the back of Lara’s legs, the paint job doesn’t have the neat finish that you’d hope for. In some places, the paint spills over, in others, gaps show let the colour underneath show through. Still, you have to look closely to find these. To anyone who’s not picking up the figure to inspect it from every angle, it looks fantastic. Even at just three inches tall, it’ll be a centrepiece however you choose to display it. Gold Edition’s hardcover art book is a welcome reprieve from the magazine-like art books I’m more familiar with (typically from barebones JRPG collector’s editions), and that quality extends throughout the book. Its 32 pages are all made of high-quality, glossy paper that lets the art shine. As far as the contents itself, they’re sufficient but nothing special. The relatively small dimensions of the pages (slightly smaller than a PS4 game case) mean that some of the finer details are hard to pick up. This is a bit of a shame, because the art itself is nice and a lot of it isn’t available elsewhere. A bigger book (and bigger packaging, by extension) would have been worth the extra cost, but as it stands, the art book is nice to have but, alone, wouldn’t really make the package worthwhile. 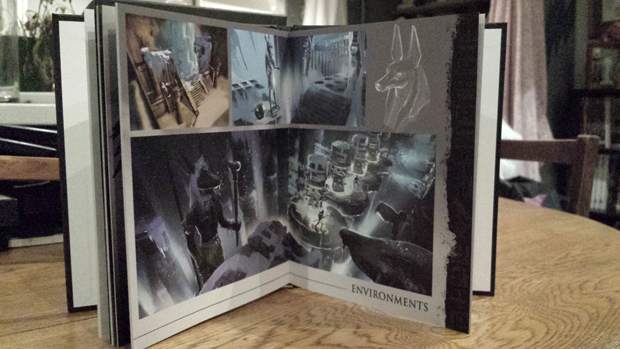 A papyrus-like finish gives the overworld map an authentic feeling, but beyond that, it’s unremarkable. Like the art book, it’s too small to do the artwork justice, and authentic feeling is undermined by a large, overt game logo in the corner. The flip side of the map has a strange diagram – a scarab, with an arrow next to it pointing to a bag of jewels, followed by a question mark. This is, in all likelihood, a hint at something within the game, though your guess is as good as mine as to what that actually is. Whatever side you’re looking at, the map is a bit disappointing, to be honest. It feels really good – as I write this, I keep unrolling and re-rolling it, enjoying the physical sensation on my fingertips – but it’s not something I’d put up on the wall. 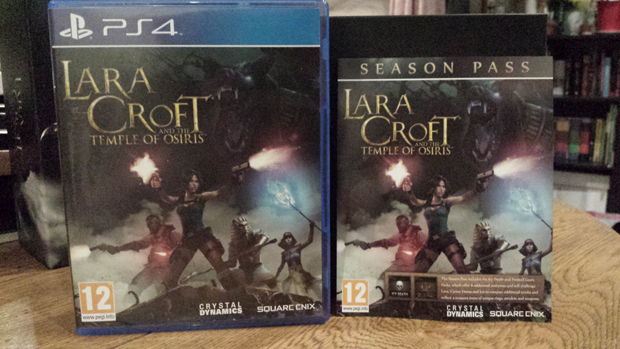 Obviously, Gold Edition includes Lara Croft: Temple of Osiris itself. Unlike most collector’s editions, that go for some sort of special packaging (usually a steelbook), Gold Edition just includes a standard PS4 case, the same as the regular edition. I suspect that many will find this a let down, but personally, I prefer it. I like the consistency that comes with regular PS4 cases – everything looks good and proper on the shelf. Steelbooks and other such cases just interfere with this. It also comes with the game’s Season Pass, which normally costs $15.95. This covers two new tombs Tomb of Hoarfrost and Tomb of the Embalmer), six costumes (a Tomb Raider (2013) outfit for each character, plus Ice Climber Lara and Tomb Raider 2 Lara), and a range of items. 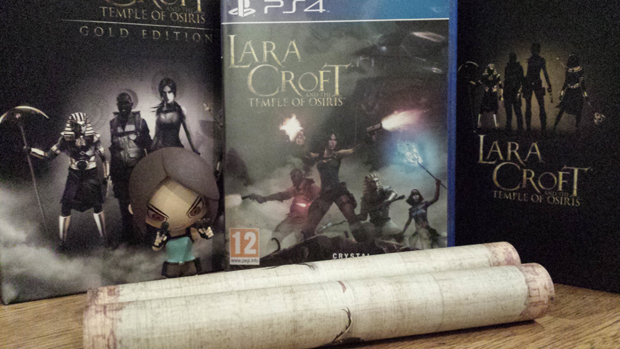 Overall, Lara Croft: Temple of Osiris is a decent, if unremarkable, collector’s edition. The Mini Lara Figure is the standout here, with minor painting issues the only blemishes on an otherwise expertly crafted and utterly adorable statue. The rest of the package isn’t anything to write home about, but if you’re buying this for the statue (which, in all likelihood, you are) they’re nice little bonuses. Lara Croft: Temple of Osiris Gold Edition is developed by Crystal Dynamics and published by Square Enix. It launched on December 9, 2014, and is available for PlayStation 4, Xbox One, and PC. A physical copy of the game, bought at the reviewers expense, was used for this review.